In a digital-first world, you need to change the way you think about communication. Schedule a demo to see why thousands of companies trust our digital signage platform to help them communicate more effectively. Get real-world insight into some of the best practices behind successful digital signage networks. Use FWI's workplace optimization products to retain top talent, drive productivity and streamline the employee and visitor experience—today and into the future. Replace your static, outdated directional signage with FWI DIRECT, a robust, dynamic wayfinding and directory solution. FWI ENGAGE leverages purpose-built digital signage applications and a mobile app to help you reinforce company culture, retain top talent and engage your entire workforce. Leave the whiteboard and paper scheduling "systems" in the past, where they belong and meet FWI BOOKED, your all-in-one meeting room management solution. See how the FWI Visual Communications Cloud reaches millions of people daily in airports, banks, resorts, corporations, stadiums, hospitals, hotels, casinos, universities and more. Powered by the FWI platform, the new Daimler Trucks North America headquarters features employee and visitor-facing Visual Communications applications that optimize both experiences. The Abu Dhabi National Exhibition Centre (ADNEC) is one of the largest convention centres in the Middle East and is considered the premier event location in the UAE region. How is FWI's Employee Engagement Rate 133% Higher than the National Average? This Coast-to-Coast outlet mall chain strives to provide their customers with the ultimate shopping experience. Since the company’s inception, they’ve created, defined and led the retail outlet industry. The home arena of this Florida NBA basketball team, is a state-of-the-art sporting and event venue with the ability to seat over 20,000 fans during home games. Early on, the team realized that due to their large fan-base, a solution dedicated to providing continuous fan engagement was a necessity. Effectively communicating to front-line staff is a challenge faced by all healthcare facilities, regardless of their size. But at one of the largest healthcare systems in the nation, finding a solution to this challenge is a top priority. This modern-day mercantile is a growing upscale retailer with 30 locations specializing in products for the ranch, home and outdoors. Our Professional Services team is here to help build and guide your Visual Communications vision and optimize your digital signs. We all know things go better with a plan. That's why we have a team of digital signage experts dedicated to making your Visual Communications program come to life. Elite implementation specialists handle everything from content creation through system engineering, training and project management so you don't have to. You have a business to run. We have dedicated experts that can handle the daily management and optimization of your digital signs, so you can focus on other things. We’re always happy to help. No matter what time of day, you can reach an FWI Technical Support professional at +1-877-204-6679. Innovation is a state of mind. 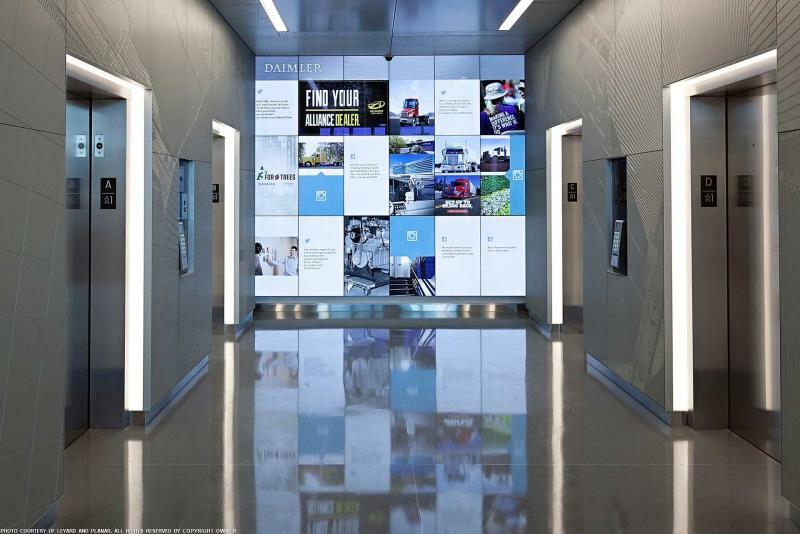 Browse our digital signage gallery for some of our greatest client collaborations across a full spectrum of environments.